This website rarely touches on politics, but this story was too good not to mention: When President Obama was in Vietnam this week, he made a point of sharing a meal with famous food-eater Anthony Bourdain. Not just any meal, of course--they ate bún chả at a hole-in-the-wall Hanoi noodle shop! 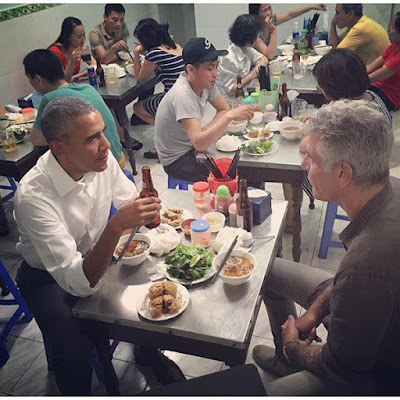 Perhaps it isn't Chinese street food, but I think an American president stopping by a street food shop in East Asia merits a mention here on chinesestreetfood.com. Read more about the Obama-Bourdain dinner here. I think Brock also like chines food. Thanks for sharing your suggestions so certainly. Its very good best portable ice maker and very excellent article. i really enjoyed this post and i hope you will keep posting this kinds of post in future.